Thomas CALL (1597 – 1676) was Alex’s 11th Great Grandfather; one of 4,192 in this generation of the Shaw line. Thomas Call was born in 15 Jun 1597 in Hernhill, near Faversham, Kent, England. His parents were John CALL and Ann [__?__]. He married Bennett (Geanette) HARRISON. 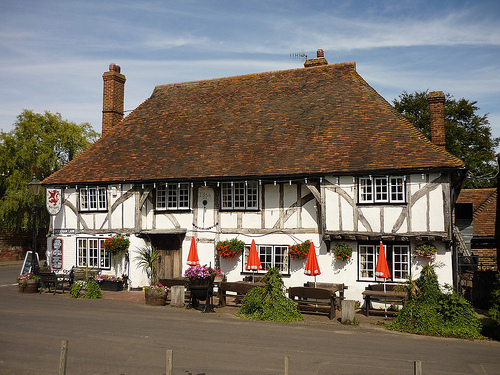 Maybe Thoma lifted a pint at the Red Lion medieval free house pub in Hernhill, Kent as it was already over 200 years old when he lived there; being built in 1364. On May 11, 1637 Thomas and his family left Sandwich, England aboard the Hercules arriving in Charlestown, Massachusetts. After July 26, 1644 Thomas married Joanna [__?__] , widow of Daniel Shepardson. His son Thomas Call Jr. later married Joanna’s daughter Lydia. Thomas died 17 May 1676 in Malden, Middlesex, Mass. Thomas Call Headstone — Bell Rock Cemetery Malden Middlesex, Mass. Bennett (Geanett) Harrison was born 21 May 1597 in Hernhill, Kent, England. Her parents were Arnold Harrison and Alice Preston or Bennett. Bennett died in 1644 in Charlestown, Suffolk, Massachusetts. Joanna [__?__] first married by 1637 to Daniel Shepardson (circa 1612, based on the estimated date of his marriage – 26 Jul 1644, Charlestown, Mass). Daniel was a blacksmith, first found in Charlestown, Massachusetts in 1633. “Daniel Shepheardson” was admitted to Charlestown church on June 8, 1633. Daniel had little to no formal education, he signed his will by mark. Joanna was named as the mother at the baptism of all three children. She married, second, between 1644 and 1651 (called “Joanna Call” in a petition of 28 October 1651 to the general court in support of Rev. Marmaduke Matthews) as the second wife of Thomas Call. Joanna died at Malden on 30 Jan 1660/61. In 1637 “Dan[ie]ll Sheaperdson” was recorded as having one and three-quarters cow commons. In the land laid out on Mystic Side on 23 April 1638 Daniel Shepardson received shares of ten, twenty and zero acres. On 30 Dec 1638 he was recorded as having one and one-third cow commons on the stinted common. In the 1638 Charlestown Book of Possessions Daniel Shepardson held seven parcels: house with garden plot; five roods arable in East Field; one acre of meadow in High Field Mead; one and three-quarters cow commons; five acres in Line Field; ten acres woodland in Mystic Field; and twenty-five acres in Water Field. In his will of July 16, 1644 “Daniell Shepardson of Charlestown in New England blacksmith” left his estate to his wife during her life, and then after her decease “my house, with the garden, yard, & three acres of ground in the neck with my arms & tools to my son Daniell, whom I would have brought up in the trade of a smith,” the rest to be divided between “my two daughters Lydia & Johanna,” wife to be sole executrix, and “my Mr. Nowell, with brother Heburne & brother Cutler” overseers; witnesses Thomas Carter and Rice Coles. Final settlement of the estate was delayed for three years, at which time the General Court ordered a distribution different from that in the will, and probably for that reason the file for Daniel Shepardson includes two copies of his will along with the original. On one of these copies Increase Nowell, who wrote the original and both copies, adds at the bottom the following note: “If his wife & 3 children die he gave me Incr: Nowell his house & house plot, at the same time before the same witnesses. Ipswich, Essex, Mass. 1662 in Ipswich, Mass. 1651 or 1653 Charlestown, Suffolk, Mass 22 Jun 1667 Malden, Middlesex, Mass. Arrived in America 1637 on “Hercules” to Charlestown, MA. To Malden in 1649. Being of Faversham, County Kent, Eng. embarked 1636 with wife and 3 children. Living near the ferry in Charlestown, on the Mystic side. The three children are thought to be John , Margaret and Thomas II Call. Philip was Thomas’ nephew. At least two more children wereborn in Charlestown Elizabeth and Mary/Mercy Call. Thomas settled down and is listed in the early Charlestown Mass town records and in the town of Malden Mass. where he eventually moved. John PASTON (Sir Knight) was born 10 Oct 1421, Paston, Norfolk, England. His parents were William PASTON and Agnes BARRY. He married Margaret MAUTHY before 1440. John died 22 May / 19 Jun 1466 ,in London and is buried in Bromholm Priory, Norfolk, England. One of ten executors of Sir John Fastolf’s vast Norfolk holdings, which comprised 94 manors. Two days before Fastolf’s death in 1459 his will was changed in favor of John Paston, who received all the manors, lands, and personal property in Norfolk and Suffolk. Suspecting foul play, the other executors were outraged, and seventeen years of claims and counter-claims, law suits, forcible evictions, arrests, and even imprisonment ensued for both John Paston I and his estate manager Richard CALL. In a letter dated Oct 1461, Call, writing from the Norwich gaol, informs John Paston II that William Yelverton and William Jenney, two of Fastolf’s executors, had him arrested and jailed for the theft of the rents from the disputed manor at Cotton: they “hathe certified vup in-to the Kynges Benche jnsurrec[i]ons [and] congregacions a-yenste me.” And unless Call posted security that he would appear in court in London, the sheriff threatened to “send me vp with strengthe of men as a presoner.” Clearly the sheriff backed the claims of Paston’s enemies. Call concludes hopefully, “God sende us a good scheryf thys yere”. Richard CALL was born about 1431. He married Margery PASTON and died after 1431 – d. AFT 1504) After Margery’s death, at some time before 1482, he married Margaret Trollopp of Edingthorpe, and had two additional sons 4. Andrew and 5. John. According to a Chancery Proceeding, Call was still alive between 1500 and 1515. 2. William – Frere minor of the Franciscan Order of Grey Friars, whose origin was St. Francis of Assisi. William Call was the last warden and minister provincial of the order. The monastary was dissolved and the lands granted to the Duke of Norfolk. Richard Call is well-known to readers of the Paston letters as the bailiff or estate manager for John Paston I and his two sons (both confusingly named John) during the last half of the fifteenth century. Young Richard Call went into service with John Paston I upon the recommendation of the Duke of Norfolk, whose seat was in Framlingham. Call served as a devoted and trusted servant under two generations of Paston patriarchs, John I, and later his two sons John II and John III for nearly half a century. Rising to the position of chief bailiff or estate manager, Call was actively involved in the Pastons’ extensive business and legal matters. He negotiated leases and collected rents from tenants; he sold land and woods; he bought and sold commodities and horses; he kept accounts, inventories, and indentures in his own hand; he delivered letters and other documents; he attended various legal hearings on behalf of the family; he transported money and silver to various family members; and he wrote numerous letters on behalf of family members and himself. In a letter to his brother, dated May 1469, John Paston III expresses his fear that if his sister Margery marries Richard Call she will be made “to selle kandyll and mustard in Framlyngham”. This contemptuous remark exposes not only the Paston’s social snobbery but, more importantly, the growing animosity between the old landed gentry and the new, upwardly-mobile merchant class, represented by Richard Call. Call’s clandestine courtship of and subsequent marriage to Margery Paston, the youngest daughter of John Paston I, caused a major uproar in the Paston household when the affair was discovered in 1469. They had secretly exchanged vows, which under church law constituted a legal marriage. John Paston III expressed the family’s outrage when he wrote that Call “shold neuer haue my good wyll for to make my sustyr to selle kandyll and mustard in Framly[n]gham”. Although the entire family was opposed to the relationship, Margery’s mother Margaret was especially shocked and outraged. Three years before their affair was finally revealed, she expressed her suspicions about Call’s character to her eldest son John by warning him to “be ware of him and of hys felowe” . Upon discovering the relationship, Margaret forced Margery and Call to appear in the Bishop’s Court where they were examined by the Bishop of Norwich. After interrogating both of them, the Bishop ruled that their vows were legitimate, but Margaret refused to let Margery enter her house. She says: “and [if] he [Call] were ded at thys owyre sche xuld neuere be at myn hart as sche was”. Although Margery became estranged from her mother and brothers for a time, Call continued to handle some of their business affairs. Unlike John Paston’s two sons, both of whom had university educations, Richard Call was self-educated. From the surviving 23 letters in his own hand, we can conclude that he was not only literate in English, but as evidenced by the “boke of French” stolen from his chambers at Hellesdon and his various memoranda in Latin, he learned at least two foreign languages. One of the functions of a household miscellany is pedagogical, and a number of the texts copied into the Cambridge manuscript concern the improvement of body, mind, and soul. Acquisition of social graces is seen in the The Lytylle Childrenes Lytil Boke, which would have instructed Call and his family in upper-class hygiene and table manners, such as “Loke thyne hondys be wasshe clene, That no fylthe on thy nayles be seyn”; “Pyke not thyne eris ne thy nostrelles”; “Ne spitte thow over the tabylle”; and “Caste not thi bones ynto the flore”. John CALL was born in 1477 in Little Melton, Norfolk, England. He married Christian (Xpian) CLIPSBY daughter of Clipsby of Obye in Norfolk. John died in 1527 in Norfolk, England. Richard CALL was born 1525 in Little Melton, Norfolk, England. He married Edith BENNETT in 1550. Richard died in 1600 in Warwickshire, England. Here is your Thomas…decending from Richard fourth child in line from John Call of Framlingham m. Rose with John Call 1. brother…where Philip eventually comes down. Margaret’s husband Thomas Green was born 1630 in Malden, Middlesex, Mass. His parents were Thomas Green and Elizabeth Lynde Thomas died 15 Feb 1674 in Malden, Middlesex, Mass. Thomas Jr. married his step-sister Lydia Shepardson on 22 Jul 1657 in Malden, MA. Lydia Shepardson was born 24 Jul 1637 in Charleston, Mass. Her parents were Daniel Shepardson and Joanna [__?__]. (see above.) After Thomas Call Jr. died, Lydia married Thomas SKINNER I [also our ancestor] in about 1680. 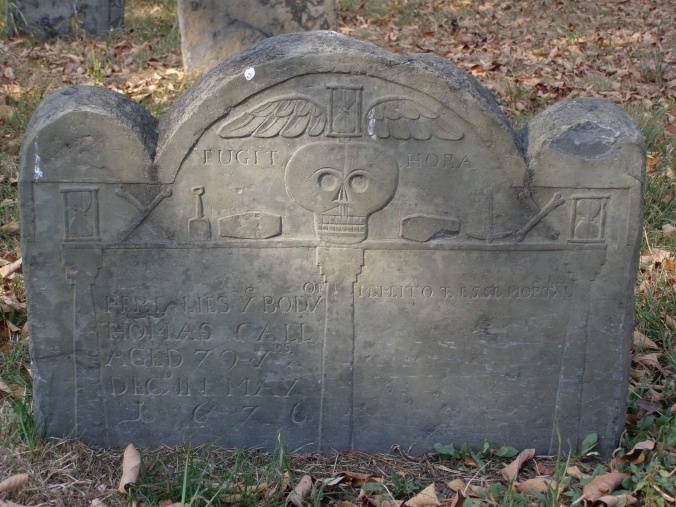 Lydia died 17 Dec 1723 in Malden, Massachusetts at the age of 87. In 1651, Thomas Call received a license to maintain an inn and sell provisions in Malden. One of the selectmen voting on the license was Thomas Call, who sold beer in another part of Malden (but probably not far Thomas Skinner’s Inn). Apparently, Thomas Skinner and Thomas Call were friends–Thomas Call rented a house from Thomas Skinner. Thomas Call died in 1678 at the age of 43. Thomas Skinner’s wife Mary died in 1671 and Thomas Skinner subsequently married Thomas Call’s widow, Lydia. John’s wife Hannah Kettell was born 27 Oct 1637 in Charlestown, Suffolk, Mass. Her parents were Richard Kettell and Esther Ward. Hannah died 27 Aug 1708 in Charlestown, Suffolk, Mass. Elizabeth’s second husband Daniel Shepherdson was her step-brother. Daniel was born 14 Jun 1640 in Charlestown. His parents were Daniel Shepardson and Joanna [__?__]. Daniel died 3 Aug 1723 in Attleboro, Bristol, Mass. Mercy’s second husband John Allen was born 9 Oct 1648 in Salisbury, Essex, Mass. John died 27 Feb 1696 in Salisbury, Essex, Mass. This entry was posted in 14th Generation, Historical Monument, Immigrant - England, Line - Shaw and tagged Kissing Step Siblings, Red Lion Pub Hernhill Kent, The Hercules 1637. Bookmark the permalink. Interesting from our point of view. In the Martin piece you have mis-spelt Romsey, Hampshire as Ramsey – Ramsey is in Cambridgeshire. Thanks for the post, a belated note to let you know I corrected the spelling. I am a Call and also have done a great deal of reseach of my Philip Call. I have toured the Philip Call in Ipswich and the house posted is not the house of Philip Call. I also have a genealogy of a decsendant. It is proven that Philip is not a son of Thomas Call but rather a nephew. A closer look at the ship’s passage the “Hercules” 1637 will tell that Philip is not Thomas’s son. There are 6 Philip Calls in a line. Starting in England and 5 being male first born. I also take offense in that we are not and have never have been a Cole. There are Coles with very simular names but if you look more closely you will see the birth dates are completely different. Robert Ring…Martha Ring’s father…Sarah Trussells mother, etc. came on the Confidence with John Cole, and John Sanders. Looking at the Paxton Letters (a treasure of England stored in the Tower of London) will tell of Richard Call who marries Margery Paxton…Thomas is down from Richard. Thank you for your post. I have corrected the picture of Philip Call’s house and changed the relationship between Philip and Thomas to nephew/uncle. Do you know about Philip’s father and Thomas’ brother? Was Thomas’ father John Call (1571 Kent, England – 8 Jul 1630 Kent, England)? I have also seen his parents shown as Richard Call and Edith Bennet. I hope you didn’t take offense with me for reporting that some say Philip CALL III’s (1684 – 1757) father might have been John Cole. I’m all for the continuous lineage of Philip Calls. My information on Philip CALL II is pretty sketchy. While there are no records on Philip Call II’s marriage or wife, there are records of his birth and probate. Do you know more? Now I am wondering, did Philip cal with his uncle on the Hercules? 1) In the first line of the descent chart it says ‘Faversham, Hernhill, Kent’. This represents a degree of mild confusion on someone’s part. Faversham is not a location in Hernhill. It is a town about 4 miles west of Hernhill, which is a village – and a delightful one at that. Maybe ‘Hernhill, Faversham, Kent’ is meant? 2) I looked up the registers of Boughton-under-Blean, the parish adjacent to Hernhill on the south. They have been printed only for the years 1558-1626. There’s just one Call entry: this is for the marriage of John Call and Elizabeth Mount on 16 January 1626. I don’t know whether this is in any way relevant. 3) I checked the Faversham Tudor and Stuart muster rolls, which have been transcribed and were published in 2000. Given that according to the line of descent Thomas Call was born in Faversham (or ? Hernhill) in 1597, one might expect some Calls to be listed. None is. However at the risk of raising hackles there are several mentions of a Thomas Coole, who was Mayor of Faversham in 1582, owned a (small) brewery in Preston Street (Faversham) and died in 1593. Given that parish clerks or clergy etc probably wrote names down as they heard them, possibly Coole and Call are one and the same – though evidently this suggestion will upset some contributors to this dicussion. It may boil down to knowing whether it was in Faversham or Hernhill that Thomas Call was born in 1597. Does anyone know? Thank you for your post. I properly arranged Hernhill, Faversham, Kent and since you said the village was delightful, I went looking for a picture to represent it. The Mount Ephraim Gardens look to be very pretty, but their site says the gardens are only 300 years old, too young to have been visited by our Thomas. I agree that spelling was in its infancy in 1600. Thank you for your acknowlegement and your understanding. First you must realize I hold this information quite dearly as it was a gift. It too was from a Call decending from the William Earnest Call line. 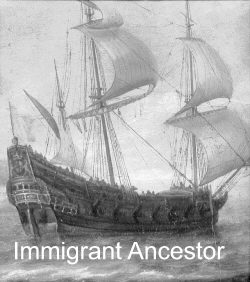 These people had gone to England long before the computer age and physically obtained this lineage. I come down from Stephen… his son John etc…. If you look closely you will notice the repetitive naming of these people and their children. There is no doubt in my mind that Philip and Mary Smith Call’s son is the father of our Philip of New Hampshire, USA. Looking at Bacton…the letters of Paxton in England and more you will actually see a Philip and the note that he no longer is in the British Ilse. Oh and note…they do not “not mention a Thomas. I must say something and hopefully it will be understood that I have looked long and very hard at all this…I too would love to have absolute proof of my lineage. Could this be the other brother that we should be looking at? 1600s or could he be Thomas’s brother. Just more to the pot. Margaret daughter of Andrew Trollop and 2nd wife children are John and Andrew. and Constance m. Thomas Riddall of Sallus in Norff. Elizabeth m. Ralph Chestin of Chestin in Suff. So again Richard of Bacton married to Margery Paxton, Paston…note the Paxton letters of England. Isn’t it wonderful that so much can be gleened from a computer these days and to think someone else spent years compiling this. I will try to copy this as I have it. The Calls came into prominence during the time of the Wars of the Roses in England 1455-1485, the Reformation and the Cromwellin periods. Outstanding among the Call soldiers was Nicholas, who with eight of his nine sons, helped to defend Kings Lyn against Oliver Cromwell and his Sequestrians. The Calls (Calle) came to England during the eighth century with the Saxon invasion. There were three brothers, one settling in the Highlands of Scotland, one settling in the western part of England and the third brother settling in the Northeastern part of England (East Anglia). From this last Call brother the William Ernest Call line is established. Richard Call of Bacton, Norfolk County, was the first Call to be named with any authority. Son of John Call of Framlingham, he came to Bacton to be bailiff of John Paston’s many estates. He had the audacity to fall in love with his employer’s daughter, Margery, and she with him. After a long and stormy courtship a reluctant consent to the marriage was granted in 1469. Of this union there were three sons, John, Richard, and William. Of Richard little is known. Williams is listed as a Frere minor of the Franciscan Order of Grey Friars, whose origin was St. Francis of Assisi. William Call was the last warden and minister provincial of the order. The monastary was dissolved and the lands granted to the Duke of Norfolk. I have been reading the posts from C. Zanne with some excitement. I have been wrestling with the story that Phillip arrived with two other Brothers and was not on the roster of the “Hercules”. I too have also seen a few obscure references that Thomas was Phillip’s Uncle. I am very interested to see how this all diagrams out, as it seems that there are many errors relating to Phillip’s ancestors already in the books. You sir… seem to have the missing information that has been sorely needed. I also, are very interested in the Call family. My wife’s grandmother, Francis Isabel Call is the family link. Passed down through the ages is the original diary of Decon John Call. My mother-in-law gave it to me. If anyone is interested in receiving scanned computer copies of pages, let me know. jpait@cfl.rr.com. I contacted the New England Historical Society last year and made arrangements for them to scan it into their files. I did not ask for a transcription from them, I wanted to make sure it was in a secure place for anyone to use. Deacon Call wrote in two directions in his diary. One way, he recorded key family events; marriage, birth, death, etc. The other direction, he recorded his daily work activities as to what he did, who he worked for and how much they owe. There is also a detailed account of his trip to Albany with oxen and cart to haul supplies up river (Hudson) to the bottom of the lake for the British. He spent many months on that job. Unless you are acquainted with the writings of the 1700s, most of his entries are very hard to sort out. I am trying to find any documentation for Thomas Call’s (b. 1597) birth to John Call and Ann ___. There are a lot of sites that list these two as his parents, but I can’t find any evidence of this. Do you have any vital records or other evidence? Or do you know where I could find it? Hi, let me look. It seems the Call family were filled with pack rats. My mother-in-law passed down documentation from over the ages. I may not have anything “official” other than hand written notes from right after Noah ran aground. I will get back with you if I find anything or not. As you well know, good, accurate information can be so difficult to find. I do not trust any info I find on Ancestry.com; or as I call it,,,copy and paste genealogy. That would be great.There are many different online trees that show Thomas Call’s parents John & Ann, or Richard and Edith. . .or. . .well, you get it. It would be great if we could find something that reduces (if not eliminates) the conjecture and hypotheses! How far down into the Call family do you go? Is it an offshoot of your main family ancestry? I try to explain to people if you go side ways enough, you can almost be related to just about everyone. I started putting the info together you asked for. I’ll try to get it off tomorrow. The closest I get is Hannah Call (1744 -1782) my 5th great grandmother, I’m not positive that the Philip Calls I thru IV are all truly father and sons, but there sure are a lot of them. I especially like their frontier stories. Hannah Call married William Hurray b. 01 Dec 1664, d. 10 Jan 1690. Their marriage ‘bond’ was pulled 13 Mar 1689 at Charleston, MA. Many people think that is their actual marriage date and is listed as such, but a marriage bond’ is nothing more than a legal agreement these two people are going to get married within the prescribed time. Lacking any specific evidence, the date the marriage ‘bond’ is pulled is normally used as their marriage date. In their case, I have seen indications that they did not marry until March 1690. Just to add more confusion to your research, it is also not uncommon for couples to marry in England, even have a couple of children, immigrate to New England and then remarry, kids and all, in the first Church they join Fun and games for sure. It had to do with being married under the Church of of England and then desiring to marry in their own faith. Hannah and William had several children in a hurry as one batch was triplets. However, none were named Phillip. I’m not sure if the question you ask about Philip Call(s) applies to Hannah and William. Use of Christian names repeatedly. This is not uncommon at all. In fact, when conducting genealogy research, it can drive you stark raving mad. Many times I have had to stop, throw the cat out the door, kick the dog, throw up my hands and scream, “I can’t take it anymore.” Then I take a break from research for a while or work on a different family. Here is how it works: A father has a daughter, she is named after the wife. The first son is named after the father. The family continues to punch out children like they are free or something. Each child will be named after a relative of the mother or father or a combination of both. Let’s say the first son named Phillip dies at age 8. The next son born into that family is named, you guessed it, Phillip. Hopefully, he lives otherwise the process repeats itself. Same rule applies to the first girl. Now, assuming the first Phillip did not die as I pointed out. As Phillip grows and gets married, his first son will be named, Phillip. Let’s drop back to Phillips siblings. A family containing 8-16 children was not unusual in Colonial times or even in later years to come. It is a rare thing for all 16 children to survive to marry and have children. Every single male sibling of Phillip, named after his father, will name each of their first born males Phillip and on and on and on. God forbid the first wife dies, he remarries and she brings her own children into the marriage and they eventually end up marrying each other. So, as you can see, it is possible for the Christian name of Phillip to be passed down for generations; along with many Nephews and first cousins named Phillip. It was their way to maintain a verbal genealogy of the family. Does this help or would you like me to look into someone specifically? I’ve a feeling we’ve been here before, but it should be possible for someone to check in the original registers of St Michael, Hernhill, which are in Canterbury Cathedral Library. The staff there can’t do searches, except perhaps with payment of a fee. The registers go back to 1557, so Thomas’s baptism should be findable, and, if 1597 is the correct date, possibly the details of his parents’ marriage. However if the mother came from another parish, the wedding would probably have taken place there. In this case the next thing might be to search in the registers of adjacent and nearby parishes, on the basis that she probably came from nearby. The next parish south is Boughton-under-Blean, whose early registers have been transcribed and printed. No mention of John there, but on 16 January 1626 another John Call – or presumably another John – married Elizabeth Mount. I did not know about the St. Michael registers. Wow. Thank you for this lead. It will take me a while to sort through all the paper work but I’ll get back with you when I can. I have a house full of relatives on vacation at our house in Florida. I need a hurricane to get them out, I think. You are the second one asking for similar information in two days. I’m working on putting what I have together and will send it out. Most times, if the excerpt does not readily appear, I have to go into British Archives. Once I get started it could take about 15 minuites or much longer. Please be patient as I have out of town company. Coat of Arms removed, when he immigrated Thomas Call was not part of the gentry and he did not have a coat of arms when he came to America.